Apartments in the metro Phoenix area—both affordable and pricey—are a hot commodity among renters and investors who are snatching up Valley apartment complexes and rental homes as demand continues to outweigh supply. According to ABI Multifamily, investors spent $1.5 billion on Phoenix-area apartments during the 2018 second quarter, up more than 13 percent 2017. Forecasters with the Arizona Office of Economic Opportunity expect the state to grow by 1 million people by 2027, with the majority of new residents settling in the Phoenix area. New Phoenicians will need places to live, and many will rent when they first arrive, even those who can afford to buy, while they explore neighborhoods to see which are the best fit for themselves and their families. This projected population growth is also fueling not only tremendous apartment development, with more than 9,000 new apartments expected to complete construction in the Valley by the end of 2018, and at least 16,000 more in the planning pipeline. But new development alone won’t meet Phoenix’s rental housing shortage, and housing officials as well as investors and developers are looking to rejuvenate the metro area’s old neighborhoods including vacant and neglected properties, aging community service buildings, relics of long-standing lack of public and private investment funds. The housing authority’s plan is to upgrade affordable housing inventory across Maricopa County by resurrecting neglected properties in older communities and has already renovated or rebuilt more than half of its rental units in the historic Coffelt-Lamoreaux neighborhood of Phoenix, and another project underway in Tempe. For smaller-scale investors and home flippers, as well as residents wishing to preserve homes on the National Historic Register, saving and renovating old and rundown properties and reopening them to renters is a big step toward providing affordable rentals at a time when the Valley’s rapidly rising rents and home prices are making it increasingly difficult for many to find housing they can afford. Throughout the central Valley, older affordable apartments have been torn down and replaced with new, much more expensive units. The lack of affordable housing is reaching crisis levels as statewide, rents are increasing faster than median incomes. For investors who aren’t prepared to buy or develop multi-million dollar rental communities, the housing authority’s projects have spurred private investment in surrounding areas. Options for refurbishing older properties and making them available at affordable prices are allowing investors to add Phoenix’s red-hot residential real estate market to their portfolios while helping to alleviate the area’s dire shortage of available affordable rentals. In the City of Surprise, for instance, The Housing Authority of Maricopa County has plans for a new affordable housing project, Heritage at Surprise, located on the corner of Rimrock Street and Nash Avenue, where Floyd Gaines Park is now. 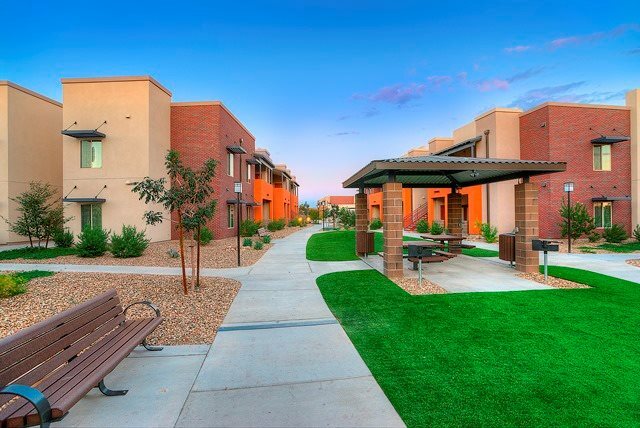 Heritage in Surprise will offer a 2-bedroom apartment for rent at $627 monthly, slightly more than half the city’s average price of $1,168, according to RentCafé. Heritage will offer 100 affordable units and is expected to be transformative for the Original Town Site. Another example is Madison Heights, an affordable housing complex on Dysart Road in Avondale. Transformed from a dreary block building with evaporative coolers to a bright, contemporary complex with air conditioning, balconies and patios, the developer constructed interior walkways and the city of Avondale added improvements including a sidewalk to the streetscape along Dysart Road. Currently, a private developer is looking to build single-family homes on a vacant lot adjacent to the Madison Heights property. By investing in neglected areas, these areas of Phoenix expects to see private investors following suit.